You can’t talk about sprinting without mentioning all these KPI (key performance indicators) in the same breath. I am referring to Triple Extension, Vertical Displacement, Stride Length (& Air Time), and Ground Contact. They all go hand in hand. I highly recommend reading some of Charlie’s works, then applying the knowledge to your training. If you still have issues with Charlie’s tainted drug image, then you can stop reading this article now. Thanks for stopping by! 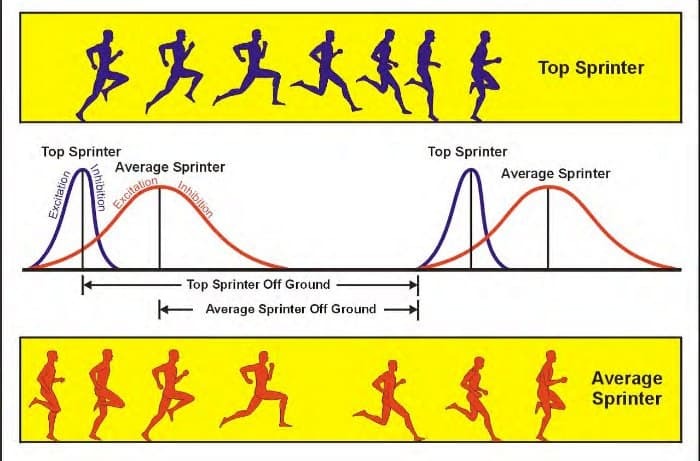 If there is one KPI (key performance indicator) that can improve your sprinting speed, whether you are an Elite world class sprinter, or a Youth/Masters sprinter, I would emphasize Triple Extension. (I’ll repeat) You can’t mention Triple Extension in the same breath without mentioning Muscle Excitation and Inhibition, Vertical Displacement, Stride Length, Air Time, Ground Contact, and increasing forces. 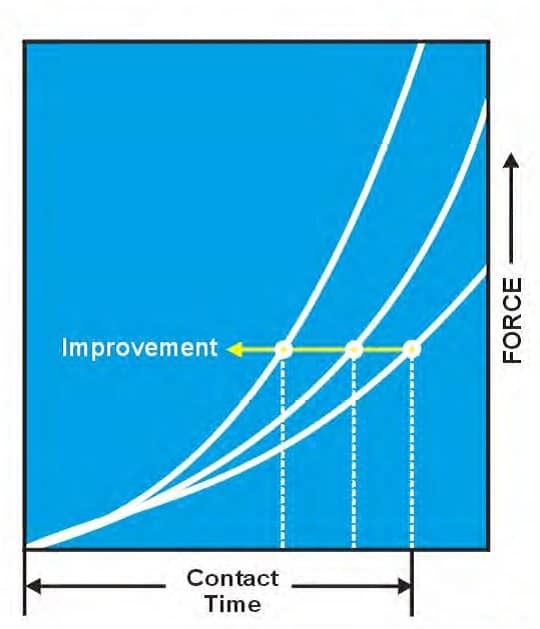 As your sprint times decrease, and your top end speed increases, you will need greater forces at ground contact, with a shorter ground contact time. 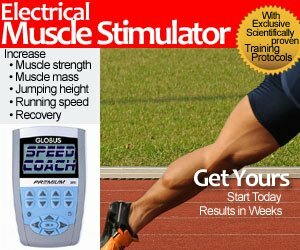 You will also need to excite the muscles faster for top speed sprinting, but at the same inhibit and relax the antagonist nerves and muscles as compared to an average sprinter. Excitation and inhibition times are shorter, and with a more forceful ground contact, you will have a longer stride length and thus more “air time”. 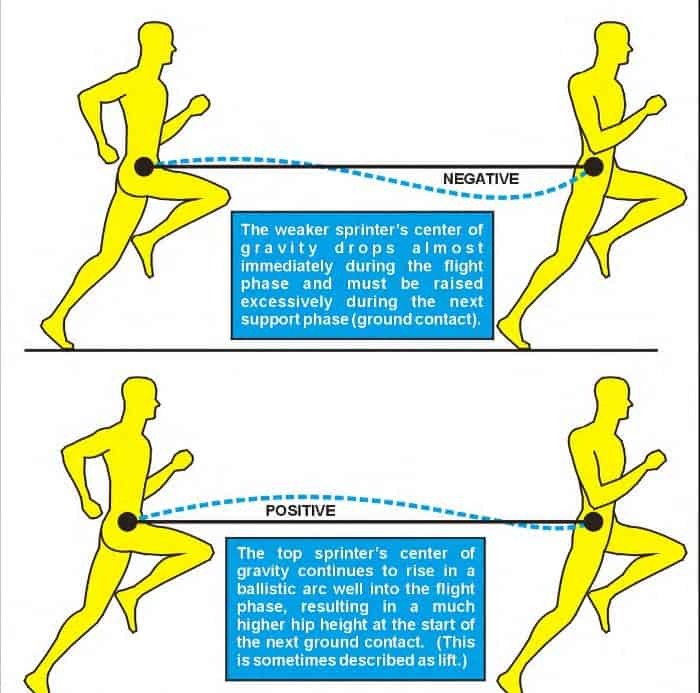 The elite sprinter will demonstrate a rise in the center of gravity, which results in a higher hip height. Charlie called this positive displacement or “lift”. (I’ll repeat the 3rd time to get my message across) You can’t leave out Vertical Displacement & Lift, Stride Length, Flight Time or Air Time, and Ground Contact in the equation. Why? 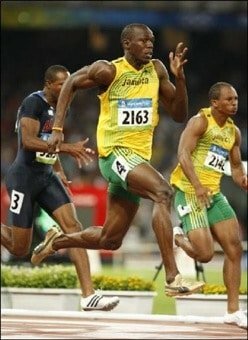 To quote Charlie Francis, sprinting is the the ability to tolerate the shock of landing determines all that follows. This means properly executed biomechanics (i.e. 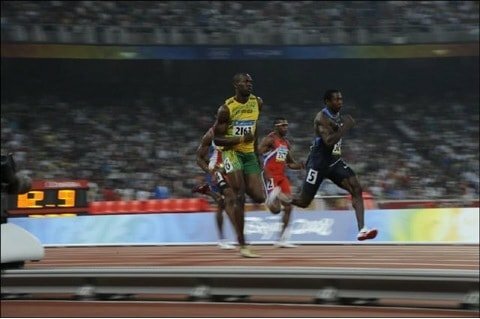 triple extension & hip height) coupled with the forces striking the ground will result in a faster sprinter, or covering ground faster from increased stride length and fast cadence. Triple Extension facilitates transfer of force through the body into the track and back. Collapsing at the hip, knee or ankle deflects the force and weakens the impulse on the track. The hip height attained facilitates the level of extension seen at and just before landing in the pictures attached. This greater extension creates a stronger position to resist force deflection at the knee, leading to more efficient transmission of force and a better quality of impulse into and back from the floor. 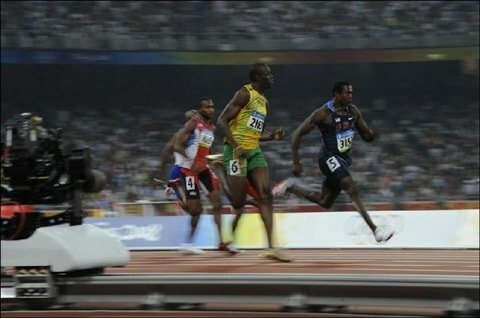 One of the major factors in sprinting quickly is the ability to cope with landing shock and the resistance to the shock of landing makes all else happen. If the knee of the supporting leg is bent, it can be more easily collapsed by landing shock. The straighter it is, the stronger a position the sprinter is in to resist “caving in”. The higher position you start from, the more airtime you have to accelerate and straighten the leg on the way back down before grounding contact. Rapid conversion from landing to liftoff also has implications for tendon stiffness, hence the advocacy of training on soft surfaces (grass, dirt) – at least for volume sessions at sub-max velocity. I know what you are thinking. 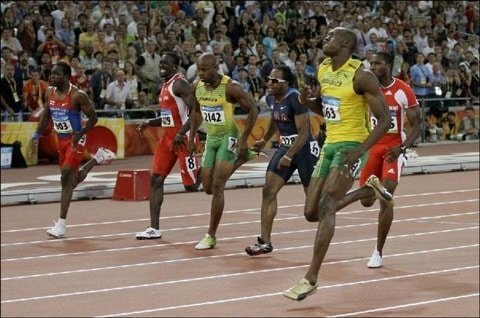 Usain Bolt is 6 feet 5 inches tall and has the advantage over theother shorter sprinters. 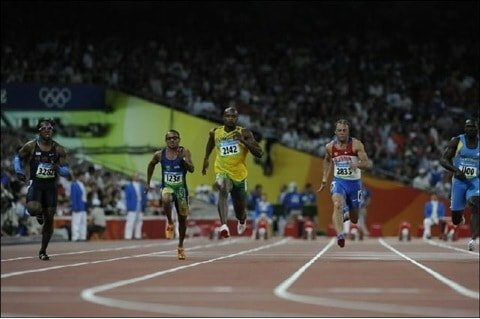 But that should not deter you from being a great sprinter. 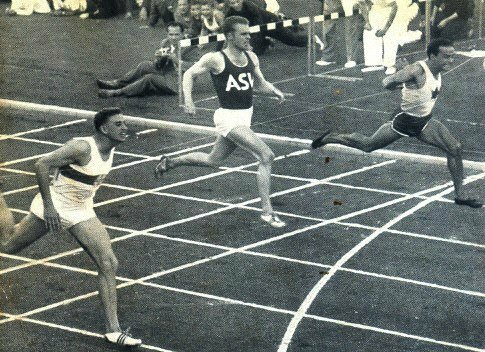 Trinidad’s Mike Agostini, the former World’s Fastest Man from another era, was only 5 feet 7 inches tall, and he had the same stride length as 6 foot tall Armin Hary from Germany. See the image below with Mike on the right and Hary on the left. To see some good examples of Triple Extension and lift, here are some images from the 2008 Beijing Olympics. Note how much Asafa Powell is airborne in the image above. 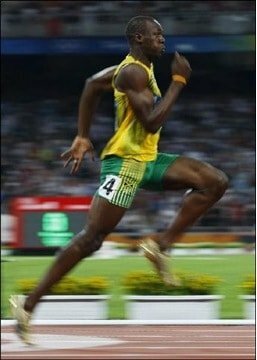 Usain Bolt in the 200m straightway.